Dino Jungles Prehistoria 300-piece puzzle by Ceaco. 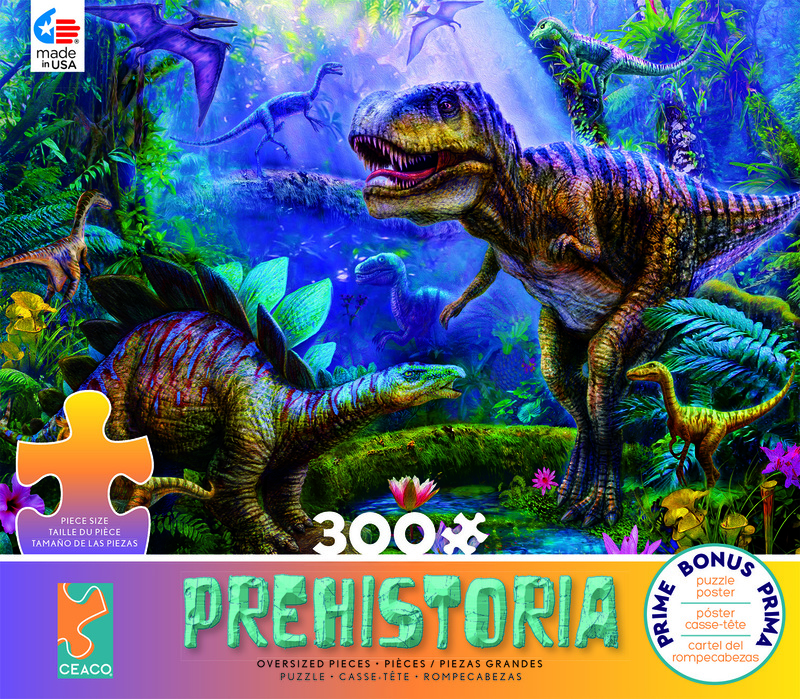 Dino Jungles is a 300-piece, large jigsaw puzzle by Ceaco, part of the Prehistoria series dedicated to educating ages 12 and up about the prehistoric world and the dinosaurs. Bring the prehistoric world to your home with this colorful and amazing illustrated puzzle that shows various dinosaurs in the jungles of the old world. A Stegosaurus and T-Rex wander through a lush, deep green jungle in search of food in the prehistoric world. Artist Jan Patrik Krasny brings her attention to detail and eye for color to this stunning illustration with deep blues and purples setting a mood of darkness, but contrasts it with bright yellows and greens to illuminate the sun shining through the trees. Each dinosaur shows incredible detail in their eyes and teeth that make you feel like you have traveled back in time to a land of the lost. I bought all of these in the series. My soon to be 6 year old grandson loves dinosaurs and puzzles. This is his first 300 piece puzzle. We are having a great time building it together.